Founded in 1986, ILSI Europe fosters collaboration among the best scientists from industry, academia and the public sector to provide evidence-based scientific solutions and to pave the way forward in nutrition, food safety, consumer trust and sustainability. To deliver science of the highest quality and integrity, scientists collaborate and share their unique expertise in expert groups, workshops, symposia and resulting publications. Whereas ILSI Europe’s activities are mainly funded by its member companies, academic experts involved in our activities contribute through their voluntary work. In addition, ILSI Europe receives funding from the European Union-funded projects they partner with and from projects initiated by Member States’ national authorities. We build multi-stakeholder science-based solutions for a sustainable and healthier world. Our way of working is designed to deliver science of the highest quality and integrity. Public Benefit: All ILSI Europe scientific activities aim for public health purpose and benefit. Collaboration: ILSI Europe believes that scientists from public and private sectors can best address complex science and health issues by sharing their unique knowledge and perspectives. Transparency: All ILSI Europe scientific activities are conducted in an open and transparent manner. The scientific outputs of our activities are made available to the public, primarily in peer-reviewed publications, to ensure confidence in our scientific integrity. All ILSI Europe activities are conducted under the supervision of the Scientific Advisory Committee. Composed by a maximum of 20 experts including more than 50% from the public sector, the Scientific Advisory Committee plays an important role in reviewing all activities with respect to their scientific validity and coherence with ILSI Europe’s programme, with the support of external academic reviewers. The Scientific Advisory Committee also provides scientific advice to the Board of Directors which comprises a maximum of ten directors representing ILSI Europe’s member companies and at least an equal or greater number of public sector scientists. Founded in 1978, the International Life Sciences Institute (ILSI) is a non-profit, worldwide foundation that seeks to improve the well-being of the general public through the advancement of science. Its goal is to further the understanding of scientific issues relating to nutrition, food safety, toxicology, risk assessment, and the environment. ILSI is recognised around the world for the quality of the research it supports, the global conferences and workshops it sponsors, the educational projects it initiates, and the publications it produces. ILSI’s headquarters are in Washington, DC. ILSI branches include Argentina, Brazil, Europe, Focal Point in China, India, Japan, Korea, Mesoamerica, Mexico, Middle East, North America, North Andean, South Africa, South Andean, Southeast Asia Region and Taiwan. The ILSI family also includes two entities: the Research Foundation (RF) and the Health and Environmental Sciences Institute (HESI). Each branch is independent and is funded primarily by its industry members. The General Assembly of Members provides the programme and financial oversight for all ILSI Europe activities and is the ultimate decision-making body upon which all member companies are represented. The General Assembly elects the members of the Board of Directors. Every year, one third of the members of the Board of Directors is on rotation. Chaired by the President of ILSI Europe, the Nomination Committee recommends candidates to the General Assembly to fill the vacancies in the Board of Directors based on their expertise, their prestige and their availability for active contribution. The Committee is composed of the President, the Chair of the Board of Directors, the Past President, two industry non-director members, and two non-industry, non-director scientists of international renown nominated by the General Assembly and representing different geographical regions of Europe. The Board of Directors recommends candidates to the General Assembly to fill vacancies in the Nomination Committee. 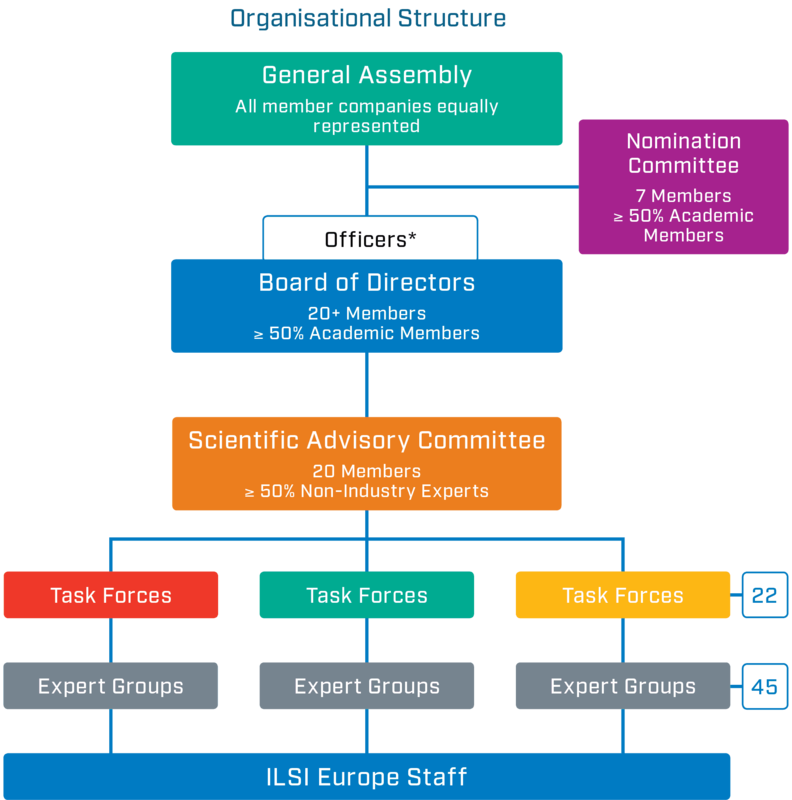 The Board of Directors is composed of 10 directors representing ILSI Europe’s member companies and at least an equal or greater number of scientists from academic institutions or governmental bodies in order to ensure a balanced input. Each year, one third of the members retires but is eligible for re-election. Candidates recommended by the Nomination Committee to fill the Board vacancies are elected for a three-year term by the General Assembly. In June 2016, the Board of Directors decided to put a two-year rotation scheme in place for Board leadership positions (both public and private). To propose amendments to the Charter of Incorporation, changes in the structure of the Institute or the dissolution of the Institute to the General Assembly. Appointing the members of the Scientific Advisory Committee and proposing the establishment or dissolution of scientific committees to the General Assembly. The Scientific Advisory Committee (SAC) is composed of a maximum of 20 experts with more than 50% coming from the non-industry sector. It is chaired by the President of ILSI Europe and vice-chaired by the Vice-President. The members of the SAC are appointed for a three-year term by the Board of Directors according to their relevant expertise, their prestige and availability for active contribution. SAC members can serve a maximum of two terms. To advise the Board of Directors on scientific matters. Task forces initiate, develop and manage all projects. They reach their goals and address their issues through expert groups, partnerships in European Union-funded projects, workshops, webinars and conferences. Task forces comprise interested company representatives and non-industry experts acting as scientific advisors. Each task force appoints a Chair, a Vice-Chair and an academic Co-Chair who will perform their duties in close collaboration with the ILSI Europe office. To replace the task force Chair in meetings / conference calls when needed. In principle, ILSI Europe foresees a rotation from the Vice-Chair to the Chair position after three years, with the possibility to extend the mandate of the Chair and Vice-Chair once (maximum two terms) if required. To actively contribute to the development and follow-up of new activity proposals. In principle, ILSI Europe foresees that the Co-Chair rotates when the task force work programme changes focus. A new task force is created when a new activity proposal is approved by the Board of Directors, after review by the Scientific Advisory Committee and external academic reviewers, provided it does not fall within the remit of an existing task force and provided it receives the support of at least 5 member companies. A task force is funded by its supporting member companies and is disbanded when its programme is completed or in case company support is below the required minimum of 5 supporting member companies. Once a task force has identified a new topic of interest, it develops a new activity proposal that is first submitted to the Scientific Advisory Committee as well as to independent external academic reviewers for their scientific review. Then, the proposal is submitted to the Board of Directors for their review and approval. When a new activity is approved by the Scientific Advisory Committee and the Board of Directors, the task force members nominate the experts identified in the activity proposal. Expert groups comprise at least 50% scientists from academia and the public sector and up to 50% industry scientists, representing on average 10 members in total. The expert group carries out the work outlined by the task force, e.g. collecting/analysing data/information and writing scientific papers. The output of their work is published primarily in peer-reviewed scientific journals and disseminated at relevant events. Each activity has to result in a peer-reviewed publication. A Concise Monograph or Black & White Report (ILSI Europe Report Series) may also be produced at a later stage, subject to approval by the Board of Directors. To be responsible for the publication of the scientific output (primarily in a peer-reviewed journal). The role of an expert group Vice-Chair is to replace the expert group Chair in meetings or conference calls when needed. 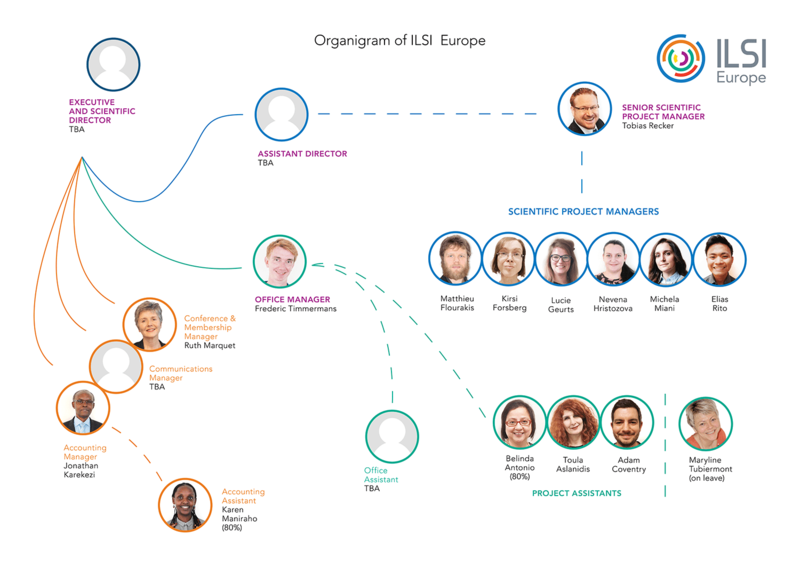 ILSI Europe’s international team is responsible for the overall organisation, coordination and accomplishment of the tasks and activities entrusted to the committees, task forces and expert groups.